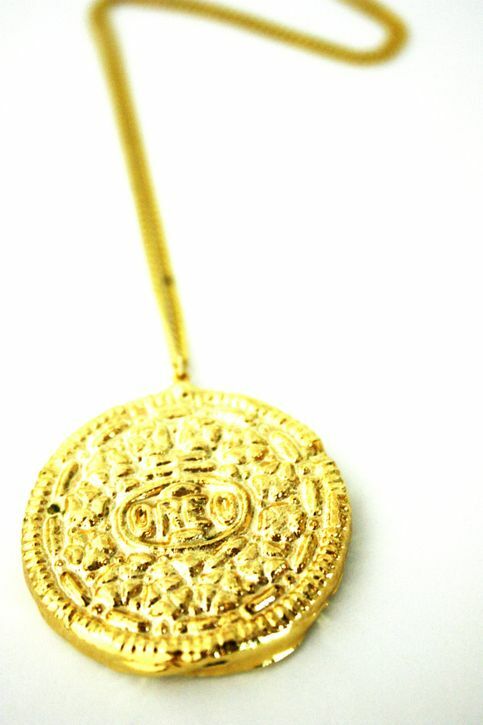 Frances Boutique, the stockist that sourced this medallion, supports local artists and artisans in the US and this little piece is unique because it was an actual oreo cookie dipped in milky solid gold… At once, a warhol-esque paean to every day brands, and an ornate trinket to jingle a light silk blouse. 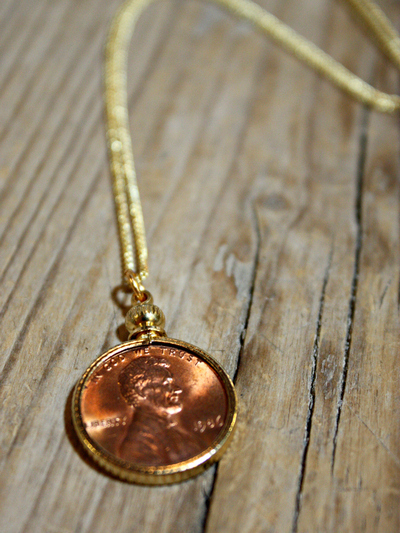 But fret not, Francis Boutique (which has an online store for those of us residing far beyond the city of Phoenix, Arizona) has a host of other items to choose among, like this lucky penny necklace ($24) which tinkers at a wider global trend for refashioning lost currency into the art of adornment. 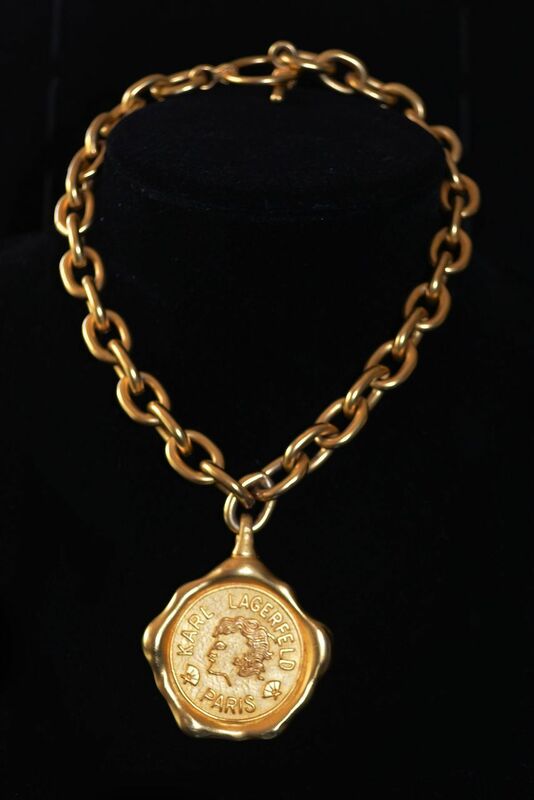 But if you want a true vintage number, this chunky Karl Lagerfeld gold plated coin necklace is up for auction at http://www.rubylane.com ($259), featuring an open link chain (16.5 inches L). 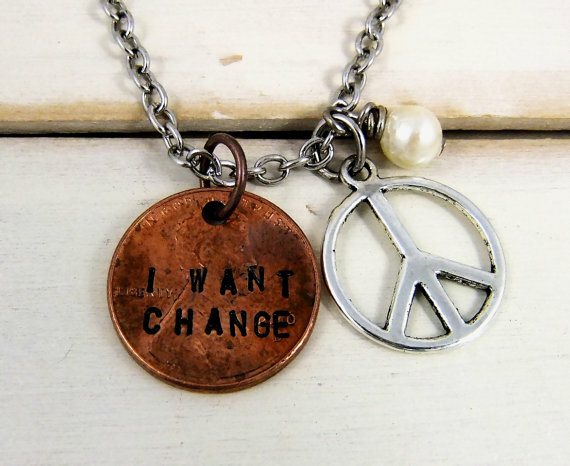 If you’re strapped for cash this month and want more substance than bling-a-ding-ding jangling off your neck, Etsy is showcasing a lovely tongue-in-cheek upcycled “I want change” penny necklace available for just £10.68, making the perfect stocking filler for our artsy-austere times. A bit more shrapnel could buy this piece which is now my favoured compensation after all the oreos were snapped up. 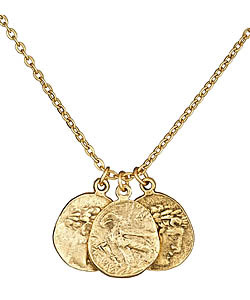 An understated multi coin necklace by Yochi Alexander ($39) with its thin gold chain accented by three Greek coin pendants featuring Alexander the Great on one face and an eagle on the other is the perfect relic to dangle stylishly just above your navel (30 inches L / gold plated). This one’s my top (available/affordable) pick this week. 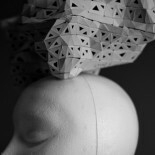 This entry was posted on September 8, 2013 by stYlobAte in fasHioN, STYLOBATE PICKS and tagged accessories, chains, christmas, Fashion, necklace, penny necklace, stocking fillers, Style, Stylobate, trinkets.